Agile Dogma: Straight-Through Quality Introducing the Agile concepts of Continuous Integration/Continuous Delivery to the Business. 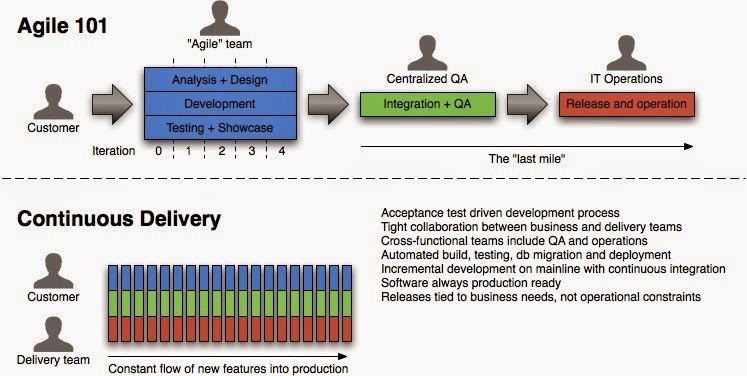 Introducing the Agile concepts of Continuous Integration/Continuous Delivery to the Business. This article will show how to start off a conversation with Business stake holders around the concepts of CI (Continuous Integration ) / CD (Continuous Delivery ). CI/CD can be a difficult concept to relay due to the amount of infrastructure and set-up that is required to get it going. Stake-holders can often baulk at the ask on start-up time and cost that this can incur. Of course there are plenty of metrics and articles out there that explain how in fact these Agile approaches in the mid-to-long term reduce cost and time to market. But this requires heavy reading validation by the Business investors. To avoid a dulling of eyes and a loss of focus from your stake holders you need to get fast buy in, using language they understand. Fortunately plenty of Business users are familiar with the concept of using Straight-Through Processing  to automate away many of the problems they have. This approach has been used quite extensively within the financial services industry and beyond. It is a proven technique. "Have you heard of Straight-Through Processing?" 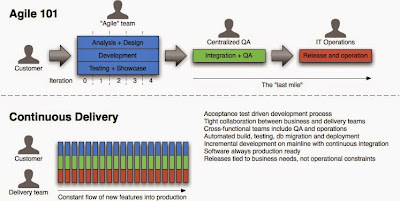 "Well Continuous Integration/Continuous Delivery is the techie-talk for what you would call Straight-Through Quality"
At this point using the concept of STQ (Straight-Through Quality ), it should now be a lot easier to explain some of the more fundamental Business benefits of CI/CD to to get their buy-in. Slowly proving these side-by-side with the multitude of metrics and endorsements you can obtain from all over the net. Yes it's as simple as that. Once you speak their language they then have a reference point to baseline all the future conversations you have with them on CI/CD. As in the end to them its STQ. You can see from the above diagram that Quality runs straight through the delivery life-cycle as a constant flow. STQ is your STP enabler. I have rarely seen a lack of customer satisfaction when receiving Straight-Through Quality.